Died in Dublin, Ireland on 20 January 2010, aged 68 years. The Diocese of Bauchi was established on 31 December 2003 and formally inaugurated on 11 March 2004 in a ceremony that included the installation of Bishop John Moore as Bishop of the new Diocese. The Archdiocese of St Andrew’s and Edinburgh, which had association with Bauchi for many years, was represented at the ceremony. The Irish Province of SMA, of which Bishop Moore was a member, was also represented. The new Diocese was formerly the Vicariate Apostolic of Bauchi, erected in 1996, created from territory of the Archdiocese of Jos, an area in excess of 64,000 square kilometres (the island of Ireland is 70,273 sq kms). Bishop Moore administers confirmation at St Joseph the Worker Church, Yelwa assisted by Parish Priest, Fr Fergus Tuohy SMA, (right) and assistant Pastor, Fr Benedict Dogo. 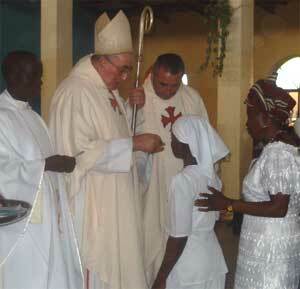 The initial evangelisation of the Bauchi area was by SMA missionaries in the 1950s. However, from late 1963 the further development of the church there was the responsibilty of volunteer priests of the Archdiocese of St Andrew’s and Edinburgh, Scotland, as a response to the earlier plea of the Pope for churches to help in missionary work. Scottish priests continued to minister in Bauchi until 1986. 29 indigenous diocesan priests, 3 diocesan priests on loan from neighbouring dioceses, 4 SPS missionaries and 5 SMA missionaries. Three religious congregations provide 9 sisters – Holy Child Sisters (4), Sisters of Our Lady of Apostles (4) and St Louis Sisters (1). There are 4 Presentation Brothers teaching in Tafawa Balewa. 22 seminarians training for the priesthood. About 68,000 Catholics in a total population of about 5.5 million. Three Primary Health clinics: Gambar and Billiri both managed by the Diocese and Tafawa Balewa managed by OLA Sisters. 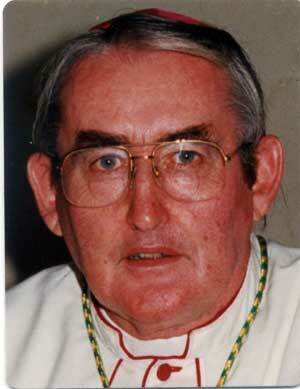 1 Immaculate Conception Secondary School, Bauchi – Fr Fergus Tuohy SMA is the Director. There is a Remedial School attached that prepares weaker students from the rural areas for entrance to secondary school. 2 Presentation Brothers Secondary School, Tafawa Balewa is run by the Presentation Brothers. There are 2 Nursery and 10 Primary schools throughout the diocese. Bauchi Youth Centre trains Youth leaders etc. It is administered by the Kiltegan missionaries and their lay staff. Gambar Catechetical Institute trains catechists for Bauchi and other dioceses in the country. There are 80 trained catechists working throughout the diocese. There are Communications, Education, Health, Justice & Peace, Pastoral Commissions functioning in the diocese. These link to and work in conjuction with the Commissions set up by the Hierarchy in the Jos Ecclesiastical Province. 22 Seminarians are at various stages of their studies for the priesthood, providing great hope for the future development of the Church there. 20 attend St Augustine’s Major Seminary, Jos. 2 attend the Spiritual Year programme in Yola diocese.